Deep into the night, I lay awake in my daughter’s hospital room, coughing and tossing and thinking about this fennel-poppy seed bread I had made weeks before. All that day, Danny and I had sat in the surgical waiting room at Seattle Children’s hospital, talking and walking and trying to not look at the clock. Nothing is dumber than the time when you’re waiting for your kid to come out of the OR. You don’t want to think deep thoughts but they keep creeping in. You desperately need a distraction, but you also feel a little silly scrolling through Facebook on your phone. In the world of tired kids in wheelchairs or babies with tubes coming out of their necks or bald, battered, smiling children coming back for follow-up appointments? Anything else seems ridiculous and small. At the same time, you know that you’re part of a tribe, a group of people who just get it. And you kind of don’t want to leave. So we paced around. Desmond was at his daycare, then being picked up by friends. Taking care of him would have kept us on our toes but it wasn’t the right place for him. Our friends Nina and Booth brought us cheese and gluten-free crackers and their homemade quince paste. That was a wonderful hour. Danny and I talked, idly, sort of wandering. We know each other’s rhythms and thoughts so well now there was no reason to articulate anything other than half sentences, nudges and gestures that suggested where we might go. We got through it. You know how the internet is filled with articles on how to raise resilient kids or how to have less stress in your life? I have an answer for you: let skilled surgeons cut into your kid’s skull, put titanium mesh in the two holes she had left after the surgery six years ago where they took the skull off her head and completely rebuilt it for her, and then put artificial bone over the mesh to hold it into place. That will remind you what’s important in life. Thoughts about baking with my daughter fall right into that category. Our girl? She’s a character. She is always moving — jumping, running, standing on her head, dancing in her chair. Like her dad, if she sits too long, she grows uncomfortable. Moving is how she understands the world. Sometimes she stops moving, like when she is studying the choreography of any dance sequence in a film — there was a solid month of Shipoopi a couple of years ago. lately, it’s all about Shake It Off, our dance party song in the morning before school — or when she’s reading. Always reading. Mostly, her feet never stop dancing. Her mind never stops dancing. She is a blur of movement, a spontaneous song, a ridiculous spinning silly giggling kindness of a girl. 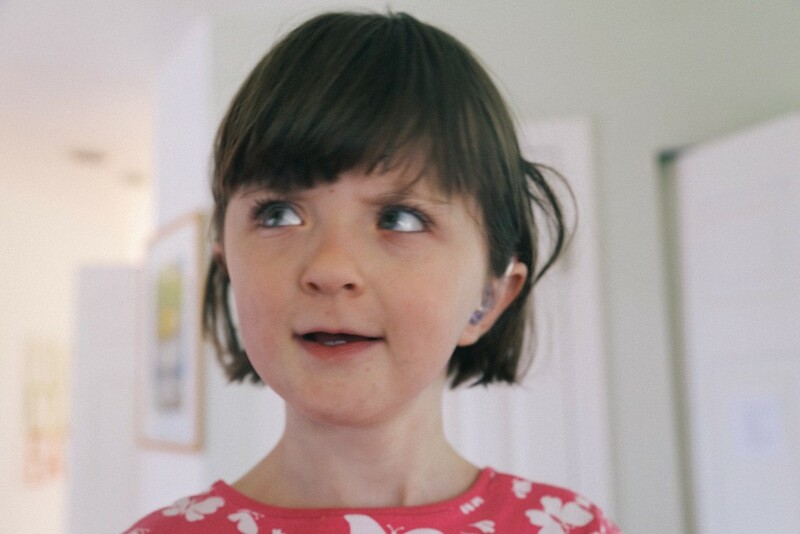 She’s already had a tough few months, starting first grade, then adjusting to her hearing aids. For the first time in her life, about 5 weeks ago, she heard the sound of rain. She heard the sound of tires on pavement as we drove, the hum of the dishwasher, the ding of an elevator, the engine on the ferry boat. Danny and I were elated for her, until we realized we were listening to the world through our ears. All we could think about was the sounds she once had lost and now had gained. As far as she was concerned, the world was unnecessarily 30% louder at first. Why? Why did she have to wear these things? She has been a trooper. And we weaned her on them, 30 minutes a day, then 60 minutes a day, then up and at em until she wore them to school all day, just as the audiologist suggested. She had grown used to them, learned to love them, even. And then we had to take them off for a bit for her surgery. Watching her recover from surgery was hard. She couldn’t move much. She asked for a treat in her hospital bed then fell asleep with the orange popsicle dripping onto the sheets. She cried out in pain, big crocodile tears. “I hate this!” she shouted as they removed the drain tube from her head. And I said as I held her hand, “I know. I hate this too. But you can do this.” She did. Danny and I traded off nights with her on the pull-out couch downstairs, our makeshift hospital bed set-up. Each day, she stayed awake a little longer and asked for a little more food. We sat up one evening after Desmond had gone to sleep, with Lucy between us, holding our hands, watching Inside Out for the first time. Oh man, that movie made me cry. We’ve been talking about it since. Lucy’s ability to stay awake through the entire film, to truly watch it, the way she studies dance routines? It made me feel like she was coming back. The next day, she asked if she could put on her hearing aids again. And she asked if we could bake together. She told me more. 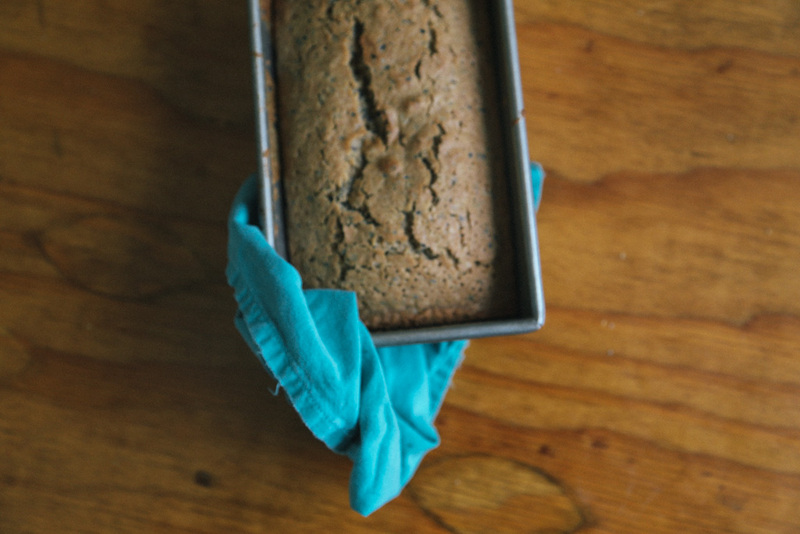 A sturdy quick bread, like banana bread or pumpkin bread, but not so moist. More like the consistency of a sandwich bread than a quick bread made with a fruit puree. Faintly sweet only, since she always cuts the sugar by at least 1/2 cup from what the recipe says. Other than that, “It’s foolproof. You can’t go wrong with this.” The original recipe is from An Illustrated Encyclopedia of American Cooking, a great old book Tita gave me years ago. My edition has a pie with a cheese board behind it on the cover and was printed in 1985. I’m sure it was first printed decades before that. (I like this piece I found in praise of the book, which truly is an encyclopedia, with recipes organized around ingredients in alphabetical order. Abalone! Herring! Olives! Shad!) It’s practical, with brief recipes that assume you know how to cook already. Tita told me she uses it more than any cookbook she owns. We do too. 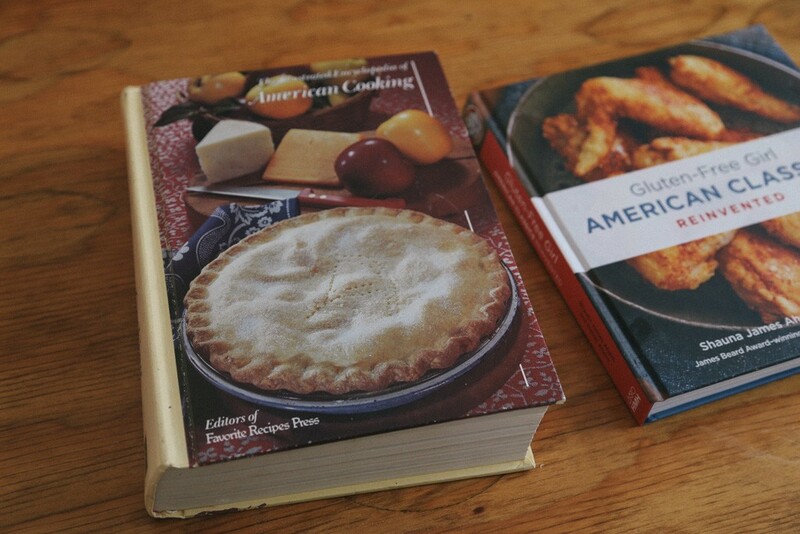 It was a great inspiration for some of the dishes in American Classics Reinvented. The original recipe called for evaporated milk, which we didn’t have. Lucy and Danny can’t do lactose, so I don’t keep it in the house. I figured if I reduced almond milk a little, it would have the same consistency as the evaporated milk. Why not steep the fennel seeds at the same time? Tita’s poppyseed bread became my fennel-poppyseed bread, made without dairy. It was sturdy enough to pack some of it in my bag for my trip to New York the night I made it. And now that Lucy is ready to bake after her surgery, we’ll have to make it again, together. The olive oil has a lovely presence in this bread. As Lucy said when she tasted the batter, “This tastes like the green olives we eat at Brandon’s restaurant.” I like that, the unexpected taste of green olives with fennel with poppyseed with almond milk. If you want something a little more plain, try canola oil instead. Steep the fennel seeds in milk. Set a small pan on medium heat. Pour in the almond milk and fennel seeds. Stir occasionally until the milk begins to simmer around the edges of the pan. When the milk has started to come to a vigorous boil, turn the heat down to low. Stirring occasionally, simmer the milk until it has reduced a bit, about 10 minutes. Remove the pan from the burner. Let the fennel seeds steep until the milk has cooled to room temperature, about 30 minutes. Strain the milk. Set aside the fennel seeds. Prepare to bake. 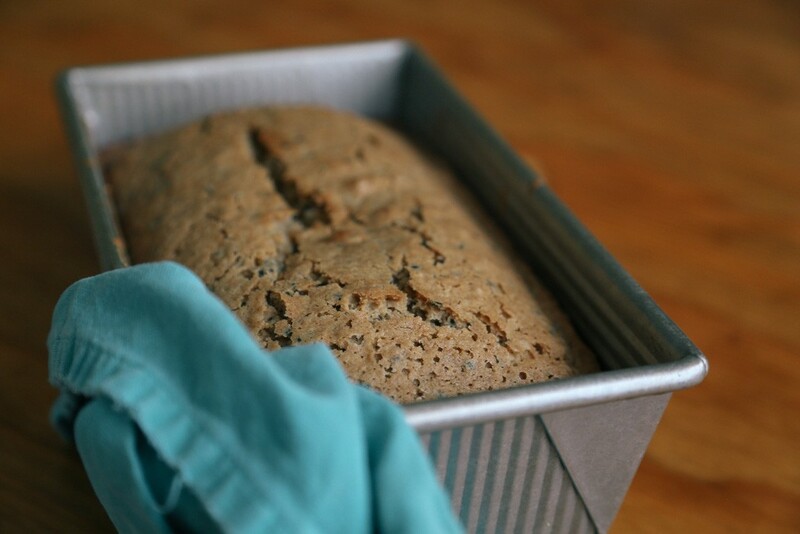 Line a 9×5-inch loaf pan with parchment paper and grease it thoroughly with the oil of your choice. Heat the oven to 350°. Combine the dry ingredients. Whisk together the flour, baking powder, and salt in a medium bowl. Make the batter. In the bowl of a stand mixer, on medium speed, whisk together the eggs and sugar until they are light and creamy. With the mixer running, slowly pour in the oil, gently along the side of the bowl, in a steady drizzle. When the oil is fully incorporated, add the vanilla extract. With the mixer running, add 1/3 of the dry ingredients to the batter. Scrape down the sides of the bowl. Add 1/2 of the almond milk. Repeat this pattern until all the dry ingredients and milk have been added. Turn off the mixer and remove the paddle. Add the poppy seeds and fennel seeds and stir them in gently. Bake the bread. Pour the batter into the prepared pan. Bake until the edges of the bread have pulled away from the pan a bit and a toothpick inserted into the center comes out clean, about 1 hour. Cool in the pan for 15 minutes, then turn the bread out onto a cooling rack and carefully put it back on its bottom. Allow the bread to come to room temperature and serve. Feel like playing? You could use any non-dairy milk you like here. Or, you could go back to the original recipe and used evaporated milk and 1/4 of poppyseeds, omitting the fennel seeds entirely. I’m pretty fond of them myself, however.